At BayView Orthodontics we understand the excitement that comes with the holidays, as well as the sugary foods that coincide with them. This is why Dr. Austin Rahaim and his orthodontics team decided to provide our patients with healthy and fun alternatives for one of our favorite holidays: HALLOWEEN! While Halloween is a fun time to dress up and trick-or-treat, we have found that there is nothing scarier than the cavities that occur, as well as the damage that your braces endure after the candy overload! This year, try making one of our favorite Halloween treats below for the next kid’s party you attend! Instead of putting out a bowl of candy at your next children’s Halloween party, try making these adorable, and orthodontist-approved, banana ghosts and clementine pumpkins! This snack is easy to assemble, kid-friendly and won’t cause damage your braces like those hard, sugary candies do. 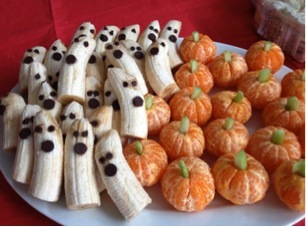 To create your spooky ghosts, take one banana piece that has been peeled and cut in half and place two mini chocolate chips into the banana as eyes. Next, take one regular chocolate chip and place it underneath the eyes as the ghost’s mouth. It’s that easy! To assemble your plump little pumpkins, take your peeled clementine and celery stick stem. Place your celery stem at the top of the clementine where all of the pieces meet and insert it in the middle. Voila, your pumpkins are complete! Arrange your pumpkins and ghosts on a fun fall platter and serve them at your next party. Kids will surely gobble them up and parents will approve of your healthy snack alternative! If you wish to get even more creative, have your kids join in on the fun by adding some personality to their ghosts! Try adding coconut around the ghosts for a spooky glow, or melt some chocolate and create a funny mustache above your ghost’s mouth. The sky is the limit! For more healthy orthodontic tips, tricks and fun facts contact BayView Orthodontics at 228-467-2211 today. We proudly provide orthodontic care to patients in Long Beach, Gulfport, Diamondhead and the surrounding Bay St. Louis areas. Have a safe and fun Halloween night! We post (with consent) photos of our wonderful patients after braces are placed! 1) Refer friends or family, and receive two (2) free movie passes to Cinemark in Gulfport or the Grand in D’iberville. You will receive the movie passes for each friend or family member that you refer! 2) iPad Giveaway – For each friend or family member you refer, your name is entered into our drawing on September 30th, 2013, for a free iPad! The more you refer, the better chance of winning the brand new iPad! 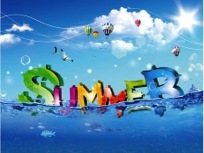 3) For current patients, send us postcards while on vacation, and you will receive two (2) free movie passes! We thank all of our patients for your referrals! Welcome to the BayView Orthodontics Blog! Dr. Rahaim and his staff of friendly professionals would like to take this opportunity to welcome you to our blog! Our Bay St. Louis, MS orthodontist office is the only full-time orthodontic clinic in all of Hancock County. We provide patients in Bay St. Louis, Gulfport, Waveland, Diamondhead, Kiln, Pass Christian and Long Beach with outstanding treatment and care in our family-oriented, state-of-the-art practice. Dr. Austin Rahaim, DMD, MS believes in creating lasting friendships with his patients. By treating each patient as a unique individual, Dr. Rahaim is able to create personalized treatment plans that ensure that the patient’s desired goals are met efficiently and without discomfort. Dr. Rahaim is always available to answer questions and to simply chat or share a joke or two! Dr. Rahaim’s warm approach to his work puts even the most timid patient at ease and his gentle and careful nature provides further reassurance that they are safe at BayView Orthodontics. Dr. Rahaim earned his Doctor of Dental Medicine degree from Nova Southeastern University College of Dental Medicine. He then went on to earn his Certificate of Orthodontics and Master of Science degree from the University of Tennessee Health Science Center. Dr. Rahaim is a member of the American Association of Orthodontists, the American Dental Association, American Board of Orthodontics and the Mississippi Dental Association. Dr. Rahaim is a native of Hattiesburg, MS and is very proud to call the Mississippi Gulf Coast his home. He and his wife have two children. Dr. Rahaim enjoys spending quality time with his wife and kids and when not working he enjoys running, watching movies and following the LSU Tiger football and baseball teams. Thanks to many recent advances made in orthodontic treatment, patients today have more options than ever when it comes to wearing braces. The metal braces we use are the most common type of braces. These braces are more comfortable and more attractive than metal braces used a few years ago. 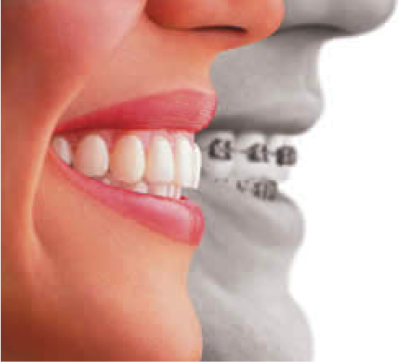 With metal braces, our patients have the option of adding colored elastics for a more unique and colorful smile. The Clear, Ceramic braces we use are made of a clear material so that they’re less visible on the teeth. These braces are used mainly on older teens and adults who have cosmetic concerns. While ceramic braces are visually less prominent, they do require more attention to oral hygiene as they are more brittle than their metal counterparts. For this reason, ceramic braces are used more often on upper front teeth than on lower teeth. The Simpli5 Clear Aligners we use consist of a series of translucent, removable acrylic trays that straighten teeth like braces. Because you are able to remove the aligners, you can eat and drink what you want and brush and floss without any trouble. Clear aligners are comfortable to wear and have no metal that can cause mouth abrasions during treatment. Our goal is to provide you with the healthy, straight, beautiful smile you’ve always wanted! During your initial consultation, you will meet our team, learn more about orthodontics and will receive a complete first examination. During this important first consultation we will review your dental and medical history forms and provide you with a complete oral exam with X-rays to determine if treatment is necessary. If treatment is deemed necessary, we will create a customized treatment plan for you and discuss all financial information, insurance options and payment plans. We will answer any questions you may have and will provide you with all the information you need to determine which treatment option is right for you. To schedule an appointment with our Bay St. Louis orthodontist office, please fill out and submit the “Appointment Request” form that is on our website. Our scheduling coordinator will then contact you to confirm your appointment. Thanks for reading our BayView Orthodontics blog! We will be sharing office news and information with you here. We will also be posting interesting reading materials here related to the exciting world of orthodontics so do drop by often to see what’s new!